Michael Jackson dolls my parents sent me. A rare confluence of circumstances led to an epic Wednesday night out: My friend Liz (Taylor, natch) was back on her feet after back surgery and really jonesing for fried chicken and doughnuts, my always-entertaining and ever-brilliant friend Michael Maness was in town after his recent month-long hiatus from work and was brimming with stories and rants and, I had nowhere to be besides eating fried chicken and drinking with two insanely fun people. We did some varsity level boozing and got home just before 1am. Consequently, I was in a daze all day, but it was worth it. Then, my dad came in from Holland! He’s here for the spawn’s first birthday this weekend (god, time flies) and he brought me two gifts that encapsulate a.) how awesome my parents are b.) how well they know me and c.) how much they love me. Mom sent a liter of 100 proof vodka (50% alcohol), and these amazing Michael Jackson Russian dolls. 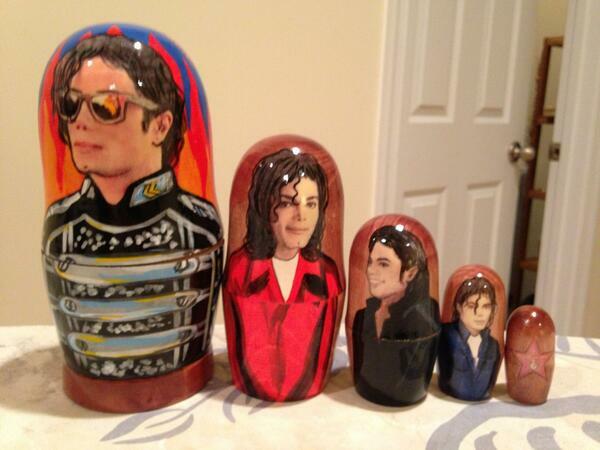 Because, Michael Jackson Russian dolls. There’s a tie for the best thing I read all day: One, is a photoshopped image that my old pal Chris Chang created of Vladmir Putin riding his dog doppleganger, and two, is a New Yorker piece defending Jonathan Franzen’s recent anti-technology rant because a lot of it we can actually get behind.